Gretchen and Steve have been married for a long time. Living in San Francisco, recently separated, with two children and demanding jobs, they’ve started going to a marriage counselor. 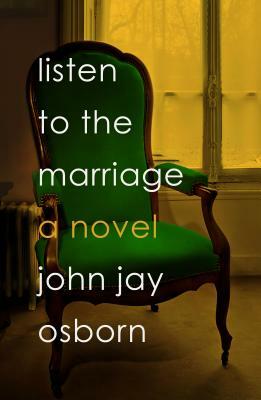 Unfolding over the course of ten months and taking place entirely in the marriage counselor’s office, John Jay Osborn’s Listen to the Marriage is the story of a fractured couple in a moment of crisis, and of the person who tries to get them to see each other again. A searing look at the obstacles we put in our own way, as well as the forces that drive us apart (and those that bring us together), Listen to the Marriage is a poignant exploration of marriage—heartbreaking and tender. John Jay Osborn graduated from Harvard Law School in 1970. He wrote the bestseller The Paper Chase while he was a full-time law student; the book was adapted into a film (for which John Houseman won an Oscar for Best Supporting Actor), and an award-winning television series. Osborn has clerked for the United States Court of Appeals, practiced law in New York City, taught at the University of Miami School of Law, and practiced in the estate-planning field, as well as giving advice and representation to artists and writers. He is the author of several novels and has written episodes for a variety of television shows. Since 1991 he has been a lecturer at the law school of the University of San Francisco.